Line J in New York's subway (a small part of the Queens Boulevard Line, former IND, the Jamaica line, then via the Williamsburg bridge to Manhattan and the Nassau Street line, those later all former BMT). 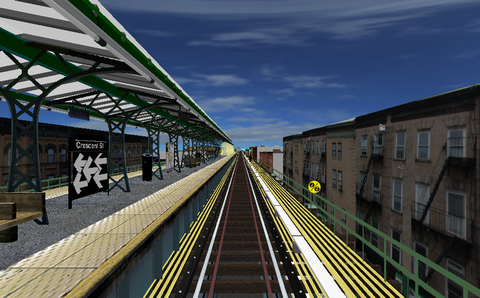 This J line simulation begins at a lay-up track beyond Jamaica Center - Parsons/Archer in Queens, starts revenue service at that station, and goes via Brooklyn to Broad Street at lower Manhattan. Then the train is moved, out of revenue service, to a layup track beyond the last station. The team behind this route provides a well-done and beautiful simulation of the highest class. Stations, trackside objects and the urban environment is detailed. Soft curves and realistic switches, announcement of stations and connections. Different alternatives for the whole or parts of the line at various times of day. There are more objects to download for this line than is mentioned on the route's download page. This route uses four object packs that are not included in the route's archive file. All archives are listed in the "Download from"-section below and are needed to get this route to display the graphics properly. This line comes in a bundle with the M line and the Z line. Download Route, object and sound files at BVEstation, 6th Avenue object pack at BVEstation, 8th Avenue object pack at BVEstation, Culver object pack at BVEstation, A line at BVEstation from which the LefShut object directory is needed.